....it's one of those hip hop albums that is understated, dope and put a stamp on the era. It really felt like the last project by Little Brother because there were talks about the group breaking up for a little while and the chemistry (no pun intended) seemed to be off on their last official album. The Minstrel Show obviously has current social commentary comparing the music industry to history with it's reference to minstrel shows, where blackface represented African American's with largely degrading roles and stereotypical stories were they only representation of African Americans. Hiding Place is one o my favorite tracks of all time.....ever. Little Brother and Elzhi all on one banger and I have no idea how many times I've tweeted "#NP Hiding Place". If you don't have any of Little Brother albums, make sure to free up some memory on your phone to start listening. And make sure to listen to it from beginning to end. LB was something special because they had a unique southern style of hip hop. By the year 2003, southern hip hop had already taken off and it wasn't the Outkast/Goodie Mob brand of hip hop that put Southern hip hop on the map. 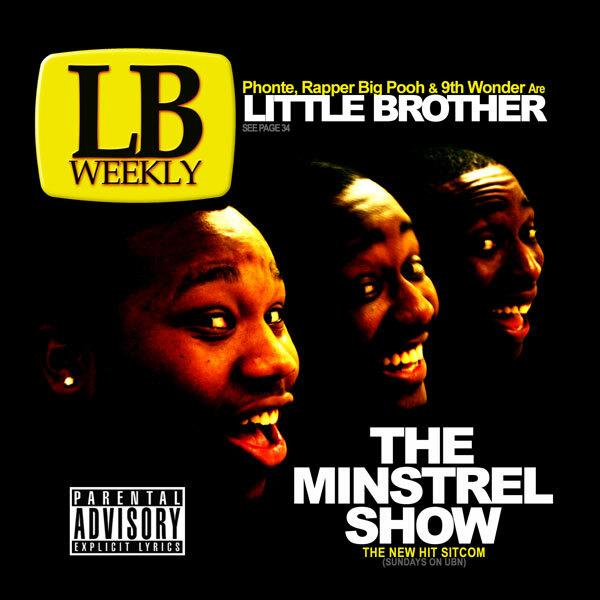 It wasn't common for southern hip hop to use dusty soul record samples and crate digging production combined with creative flows like Little Brother did. Phonte's self conscious style was grounded, funny and flamboyant at the same time (with a sense of humor). Big Pooh's style balanced Phonte with his passion to prove himself and establish himself as a lyricist and his sometimes blunt self-self deprecating jokes. It made Little Brother a passionate duo of mc's and that doesn't even address how 9th Wonder impacted the hip hop world. Before I start on 9th, Big Pooh still has that drive and he's even developed his skills more since Little Brother parted ways. He's made some serious cameo appearances that made me do a double take and appreciate him more as an emcee. Where do I start with 9th Wonder? The Minstrel Show is really just one example of where 9th Wonder shows the master of his craft where he produced 13 of 17 tracks. 9th has worked with so many different artists over the years and The Minstrel Show is definitely one reason why so many rappers want to work with him. He's produced with/for MURS, Buckshot, Pete Rock, Jean Grae, Jay Z, Skyzoo, David Banner, Sean Price and so many other artists, I don't have enough time. He's easily one of the best producers of all time. I won't go on forever, but I have already touched on the topic of what I think of 9th Wonder on a previous review The Wonder Years.